After two New York Times bestsellers, Nick Offerman returns with the subject for which he's known best—his incredible real-life woodshop—in a program that includes five original songs. Nestled among the glitz and glitter of Tinseltown is a testament to American elbowgrease and an honest-to-god hard day’s work: Offerman Woodshop. Captained by hirsute woodworker, actor, comedian, and writer Nick Offerman, the shop produces not only fine handcrafted furniture, but also fun stuff—kazoos, baseball bats, ukuleles, moustache combs, even cedar strip canoes. Now Nick shares his experience of working at the woodshop with his ragtag crew of champions, tells you all about his passion for the discipline of woodworking, and teaches you how to make two of the woodshop’s most popular projects along the way: a Pop Top bottle opener and a three-legged stool. This audiobook will take you behind the scenes of the woodshop, both inspiring and teaching you to make your own projects while besotting you with the infectious spirit behind the shop and its complement of dusty wood-elves. 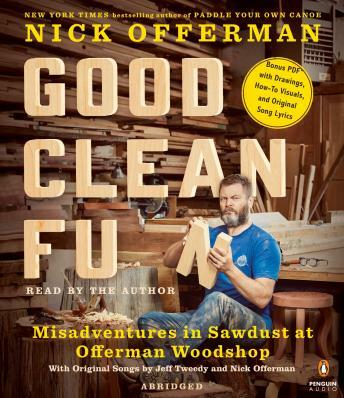 Good Clean Fun also includes writings by Nick, humorous essays, odes to his own woodworking heroes, insights into the ethos of woodworking in modern America, andother assorted tomfoolery, all imbued with Nick Offerman’s brand of bucolic yetworldly wisdom. *Includes a Bonus PDF with Drawings, Visuals, and Original Song Lyrics. I expected more from this than what it was. The book starts off interesting but soon delves into the history of the OWS employees/members, which whilst important to the author are of no huge interest to anyone else.